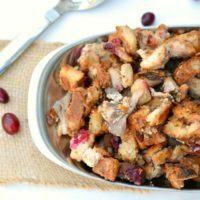 This easy gluten free cranberry stuffing also features maitake mushroom, pear and is just as good as any gluten stuffing! We are getting closer to Thanksgiving and many who are gluten free think they have to pass on the stuffing. This is so far from the truth. So this year, don’t pass on the stuffing! 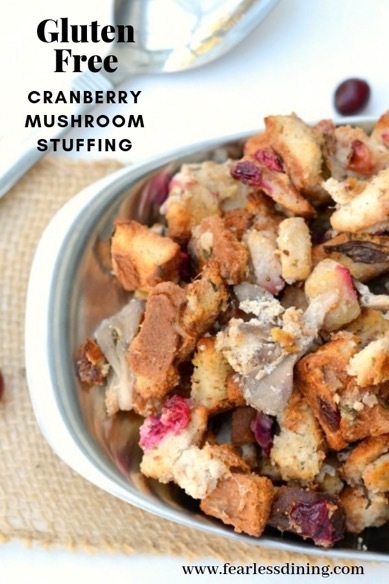 Give this gluten free cranberry, pear and maitake mushroom stuffing a try! The foundation of this stuffing recipe is the “ends.” Gluten free bread loaf end crusts to be exact. My kids hate crust and they hate ends. They just won’t touch them. 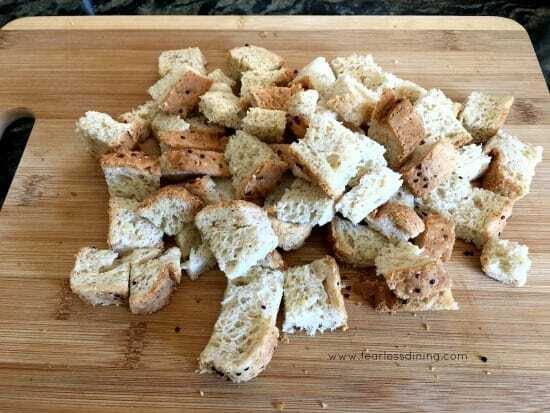 Gluten free bread is expensive….so what do you do? My kids leave lots of Udi’s bags in the freezer with just the ends. I go in once every couple of weeks and consolidate the bags, keeping a large bag filled with “ends” to be used someday. This time, I was fortunate. I not only had enough to make this delicious stuffing, but I also was able to make some delicious bread pudding. My kids love this Classic Gluten Free Bread Pudding and this Gluten Free Sweet Potato Bread Pudding! What gluten free breads are best to make stuffing? For this recipe, I used some beautiful red pears. 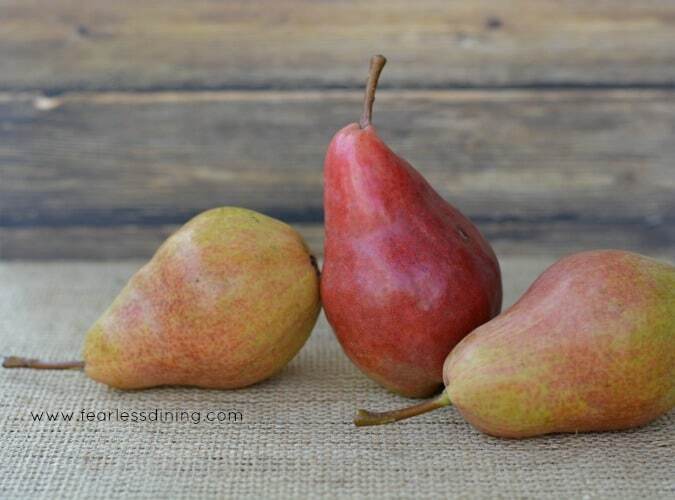 These pears are so crispy and sweet and their flavor really comes out beautifully in this recipe. 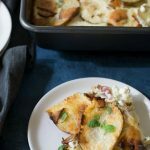 If your family loves pears as much as mine, they might like these Paleo Pear and Cinnamon Muffins or these Gluten Free Gorgonzola and Pear Scones. Over the next week, I will be posting some of my favorite recipes for Thanksgiving. What some of your family favorites? 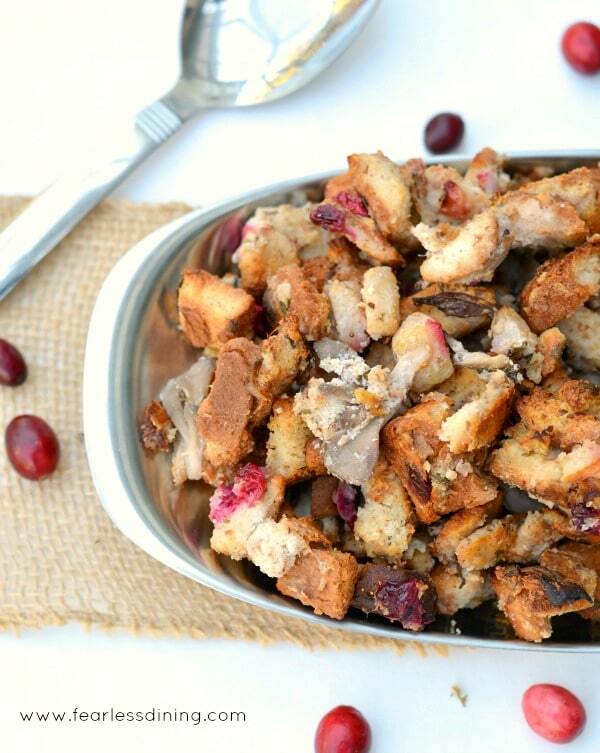 Are you ready to see how easy this Gluten Free Cranberry Stuffing recipe is to make? 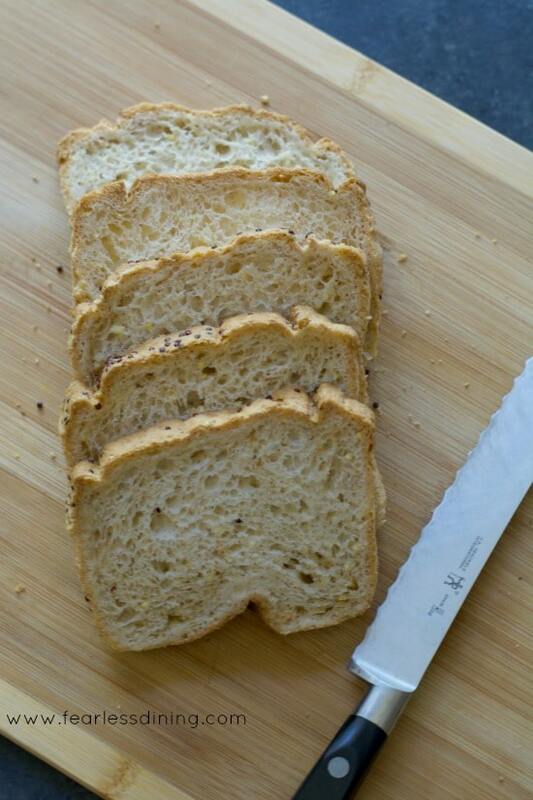 The first step is to take your favorite gluten free bread and cut it into cubes. You can make the cubes of gluten free bread any size you like! 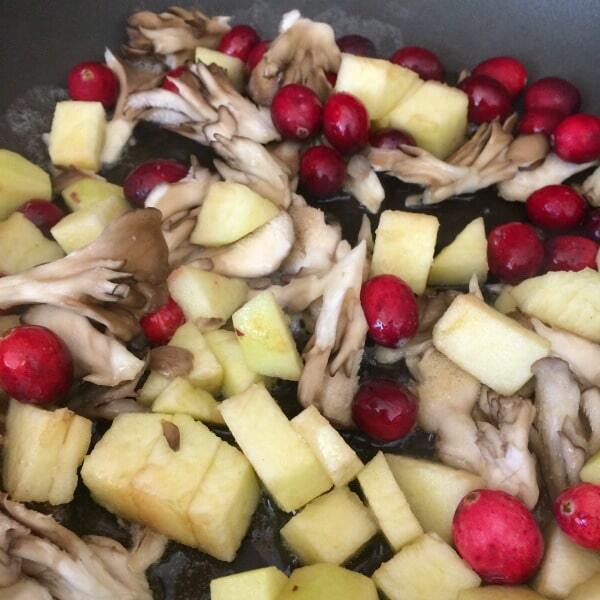 In a pan, cook the pears, cranberries, and mushrooms on medium heat for 8-10 minutes. 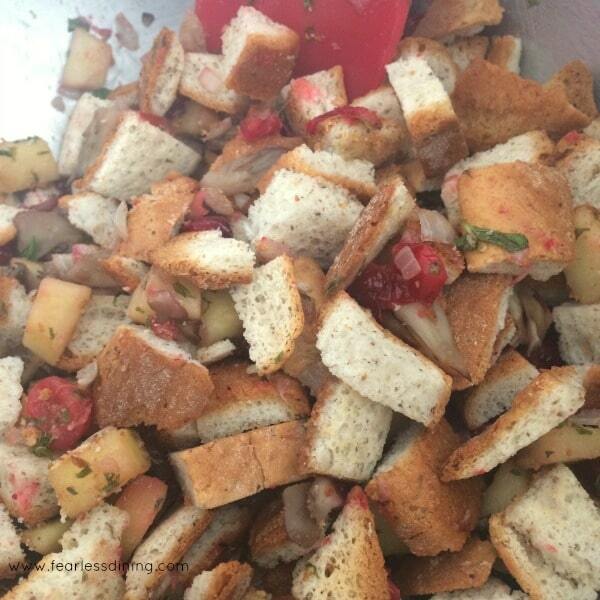 Add the cooked vegetables and other stuffing ingredients to the gluten free bread cubes. Mix well to coat all of the bread cubes and bake for 20-25 minutes. A baking dish that can hold all of this stuffing! A big mixing bowl to mix up all of the ingredients. (And a bonus, the rubber bottoms means the bowl won’t slide all over your counter as you mix things. 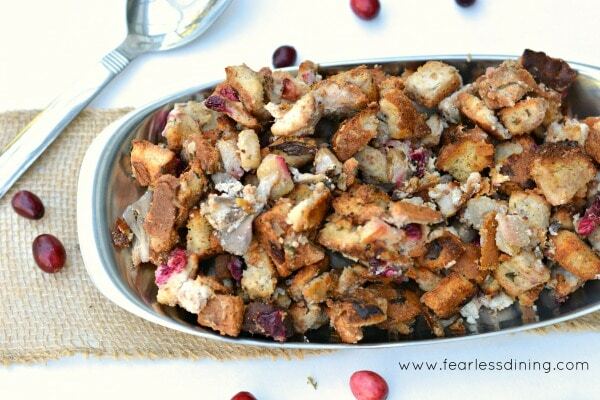 Here is a wonderful gluten free pear and cranberry stuffing recipe that will be a family favorite this Thanksgiving. In a large bowl, add bread cubes and toss with 2 tablespoons melted butter. In a big baking dish, lay the bread cubes out. Bake until they turn a light golden color. In a pan, melt butter. Add onion, pear, cranberries, and mushrooms. Cook until fruits and vegetables are soft. Add mint, parsley, salt and pepper. In a small bowl, combine milk, egg whites, and chicken broth. Mix well and pour onto toasted bread cubes. Add veggies from the pan. Bake for 20-25 minutes until cooked. 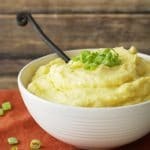 More Yummy Side Dish Recipes to Try! Just checking… 3 cups egg whites? I’d love to be enter into the drawing for a chance at the Zemas mixes. Last night I made your almond joy brownies. They were great. Thank you for the recipes. You take the guess work out of gluten free cooking. Hi Susan, You are so sweet. I am so glad you liked the Almond Joy brownies 🙂 Have a great day and I have you entered in the drawing. This stuffing looks amazing! 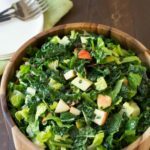 Love all the different ingredients you added! I love the idea of adding pear to stuffing! I bet this is absolutely delicious– pinning! This is absolute genius! I love how creative you’ve gotten with traditional stuffing! And such a great money saver with using the leftover ends. I’ll be pinning this and sharing since my readers have been asking for a gluten free stuffing for Thanksgiving. I’m working on a grain free stuffing for the holidays but time is running out, lol. This looks amazing, I would’ve never thought to use mint but I bet it’s delish! Wow Christina, I am in awe of you. What are you using for a grain free stuffing? I suspect that will be wildly popular with the paleo crowd.